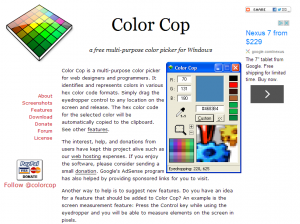 Color Cop is a multi-purpose color picker for web designers and programmers. It identifies and represents colors in various hex color code formats. Simply drag the eyedropper control to any location on the screen and release. The hex color code for the selected color will be automatically copied to the clipboard. It’s a great tool for any color blind web designer!